There have been a lot of discussions about investing in cryptocurrencies over the past few months. This is because of increasing values of almost all the crypto coins. Bitcoin is the most valuable cryptocurrency with Ethereum and Ripple behind it. Nowadays, total market cap of cryptocurrencies remains between $400 to 500 billion. The experts are hopeful that the market cap of cryptocurrencies will hit $1 trillion in 2019. These increasing values are attracting investors and businesses to invest in these digital currencies for far reaching benefits. Almost all the cryptocurrencies are based on blockchain technology for secure, fast, and reliable fund transfers. Ripple takes the lead in this regard because the blockchain technology employed by it is latest and more beneficial. Ripple XRP is not only a digital currency but is a payment platform that has eased the cross border transactions. More than 100 companies across the world have adopted its blockchain for cross border transactions. American Express, MoneyGram, LianLian are some of those companies. Moreover, many large banks and financial institutions across the world have adopted Ripple as a cross border payment platform. Still, many are planning to join it. This growth in Ripple’s database is attracting peoples and investors all across the world. India is also no exception where many investors are planning to invest in Ripple. One of the largest problems the Indians are facing is where to find XRP token. There are many crypto exchanges in the country which also provide the facility of trading Ripple. Even, some exchanges are offering to exchange Ripple with their local currency. If you are also an Indian and facing this problem, this article will guide you through to the process of buying Ripple XRP in your country (India). This article will tell you about top three crypto exchanges in the country that are providing the facility of trading Ripple XRP. Following are the top three crypto exchanges that are offering Ripple XRP trading in India. The rising demand of cryptocurrencies in India has increased the number of crypto exchanges in the country. Koinex is one of those latest crypto exchanges that have earned a great name in a short span of time. Koinex is a Mumbai based crypto exchange that is providing the facility of trading in many cryptocurrencies including Bitcoin, Ethereum, Ripple, Litecoin, and many more. Rakesh Yadav, Aditya Naik, and Rahul Raj are the cofounders of this crypto exchange that is playing a key role in bringing the benefits of blockchian technology to the Indians. Koinex offers support for multi currencies and is adding more and more cryptocurrencies for trading. Most of the users in the country say that they have invested in this crypto exchange because of lightening fast verification process. Koinex also offers the facility of storing XRP tokens into an online wallet. (Never store your assets on an exchange read this article: 5 Tips To Protect Your Digital Currencies) Following are the pros and cons of investing in this crypto exchange. Allows trading in local currency INR. Verification process or KYC verification is a lot faster. Allows storing tokens in an online wallet. Offers chatting functionality to chat with fellow traders and investors. Quite easy to use due to user friendly interface. Takes much higher fees for transactions. KYC verification is not free and the exchange deducts Rs 100 for this verification. Less users and volume of trade is too low. Offers no incentives to first time users. Does not show buying and selling calculations. Buying Ripple (XRP) through Koinex is not much difficult. You can follow the steps below to trade Ripple XRP on this exchange. 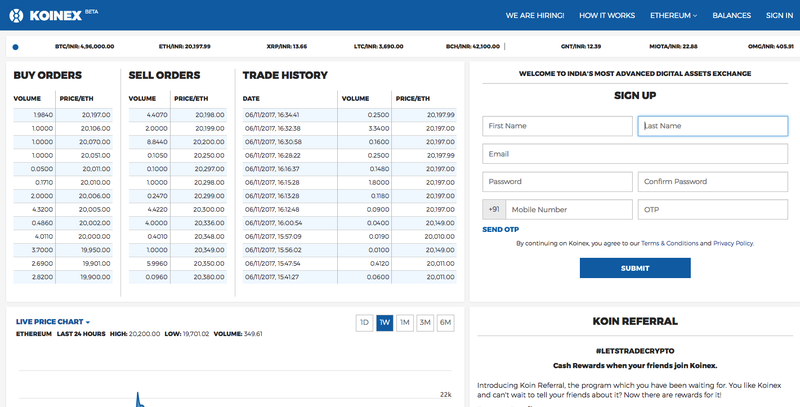 The very first step for trading Ripple XRP through Koinex is the creation of account with the website. The account creation is quite free. Go to signup section on the web page and fill in all the required information. These are the first name, last name, verified email ID, and mobile number. After you have filled in all the information, press the submit tab. The website will send an email to your given email ID. After clicking the link sent to your account, you can activate your account. Here, the registration process is completed. After account creation, the exchange requires KYC verification before allowing you to trade Ripple XRP. This verification is also not much difficult and can be done through any of government document including Aadhar card, PAN card, passport, driving license, and ID card. Normally, Koinex verification process takes 48 hours to complete. Once KYC verification completes, you are required to link your bank account. Here, it is noteworthy that you can link only one bank account at a time. All the trading and fund transfers will take place through this account. If you have more than one bank account, be cautious in linking the bank account. Always link the account with balances or the account which you use frequently. Koinex opens a separate account in your name where you would add your bank account as a payee. All the details regarding your bank account are available under balances tab. After linking bank account with the exchange, you can now transfer funds in your account. Koinex is best of all the crypto exchanges of the world in this regard because it tends to show your deposited funds on the website within five minutes after your transfer. No other exchange in the country is providing this facility in the country. You can check the deposited fund under balances tab on the website. Here, it is worth mentioning that Koinex provides the facility of funds transfer directly from your wallets. This means that you can pay through your mobile wallet like Airtel Money, JioMoney and others. The only difference between this payment and linked account payment is that wallet payment is costlier than bank deposit. The website takes 2% service fee for deposits through mobile wallets. Now, you can trade cryptocurrencies with Indian rupees. As the exchange offers trading in multi currencies, you will have to select Ripple XRP for buying. Here, it is also necessary to mention that the website takes 0.25% trading fees on transactions. One of the drawbacks of Koinex is that the investors or traders are unable to know the trading volume which the other exchanges across the world are providing. This is because the trading volume of the exchange tells the investors a lot about the fluctuations in the market. BuyUcoin is one of those crypto exchanges that have revolutionized the cryptocurrency trading in India. Since its launch, the platform is continuously upgrading its blockchain and has become the top secure, reliable, and trusted cryptocurrency platform. It also offers multi currency support and accepts payments through various methods. The exchange has more than 15,000 registered users that trade cryptocurrencies through its blockchain network. Ripple (XRP) is also among the cryptocurrencies that are supported by this exchange. It offers free and convenient way of registration and allows trading right after 24 hours of depositing funds. Following are the pros and cons of this crypto exchange. Takes no fee on trading. A lot of security features. Have thousands of users and processes huge trades. Highly overpriced as compared to other exchanges. 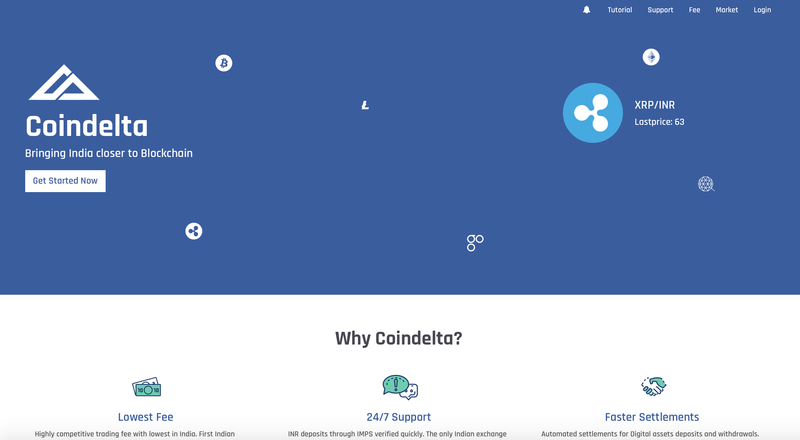 Coindelta is also a new but very good exchange that is facilitating the Indians to take advantages of blockchain technology. The exchange operates on the concepts of maker taker and takes minimal fees. It would be quite right to say that this exchange takes lowest fees than all other crypto exchanges trading in India. This exchange offers trading in various cryptocurrencies and also accepts Indian rupee. Coindelta takes the lead over all other Indian crypto exchanges as its processes the KYC verification in a few hours. Here, it is also important to mention that this exchange does not take any fees for KYC verification. The only problem with this exchange is that it does not have user friendly interface. This makes it extremely difficult for the new users to use this exchange. You have to go to the official page of the exchange and click the ‘get started now’ tab for signup. The process of account creation takes a little time because the exchange requires some verifications including KYC. After verification, login to your account and trade the cryptocurrency of your choice. Here, it is pertinent to mention that KYC verification process asks the users all personal and bank account details. The users have to link their bank accounts for trading. Once the verification is complete, you can trade the cryptocurrencies. The exchange takes only little fees as compared to other Indian exchanges. The registration process with this exchange is quite simple. Go to the main page of the official website of the exchange. Enter your email ID and then verify this email ID through clicking the link sent by the exchange. After completing registration, you can directly trade cryptocurrencies. Note: BTCXIndia says that it is going to stop its operations due to increasing governmental pressure for stopping cryptocurrency trading in the country. The exchange says that it would not entertain the deposits made after January 1st. The deposited money will automatically return to the customers’ account. BTCXIndia offers an easy way to register and takes no registration fees. It also requires KYC verification which takes about 2 weeks to complete. The exchange also offers competitive exchange rates as compared to other crypto exchanges operating in the country. BTCXIndia takes no fees for storing the coins in wallets but takes just 1% fee on each transaction. The exchange is a lot secure and offers a pass code method for additional security. Here, one thing to keep in mind is that this pass code once lost cannot be recovered. Following are the pros and cons of this crypto exchange. The most trusted and the oldest crypto exchange. A lot secure due to pass code method. Largest customer database in the country. Provides exchange directly with Indian currency. Takes too much time for verification. Does not provide good customer support. Withdrawals take a lot of time.